I dislike myself even a bit for testing all these pumpkin recipes in August. I’ll be sharing them next 2 months, so hopefully at some point, fall excitement will overtake you. I really do like summer and I’m sorry to see it go. We’ve been having so much fun outside the past weeks, and I’m not ready to be stuck indoors with two toddlers. 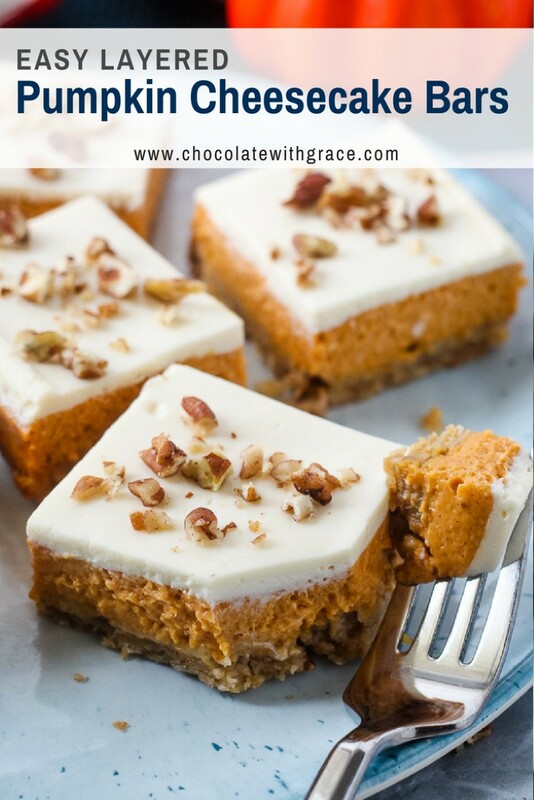 And if you’re one of those people who are super excited about pumpkin recipes, I’m excited to share them all with you. Meanwhile, check out my soft pumpkin cookies, pumpkin dump cake and pumpkin cake roll. They are all favorites and some of my most popular. First, you’ll make a simple shortbread crust with pecan or walnuts. Then we will press it into a pan and partially bake while we prepare the pumpkin cheesecake filling. We will take softened cream cheese, it is best if it has sat out for 4-5 hours to get it completely to room temperature. Cream cheese takes longer to soften then butter. And beat in sugar, eggs, pumpkin and some pumpkin pie spice of course. Spread this onto the pre-baked crust and bake for 20 minutes. While it’s baking prepare the sour cream sugar topping, which is simply sour cream, sugar and vanilla. Immediately after removing from the oven, carefully pour on the sour cream topping and smooth it out with an offset spatula. This one is my favorite. Bake for a few more minutes until topping is set, cool and cut into bars. I like to garnish mine with a few more pecans. Once cooled, these bars should be kept in the refrigerator until ready to serve. They will keep for 2 or 3 days before they start to look a little sad. But you can keep them in there up to 4-5 days. 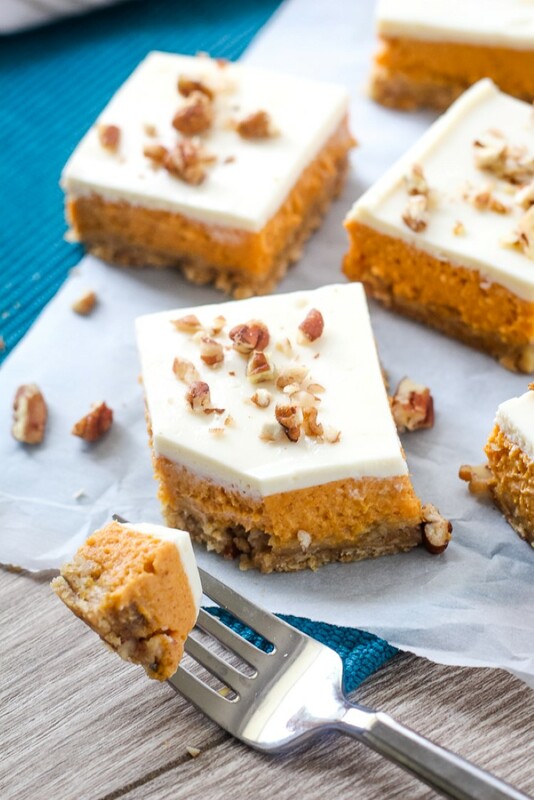 Yes, I mentioned it above, but pumpkin cheesecake freezes beautifully. 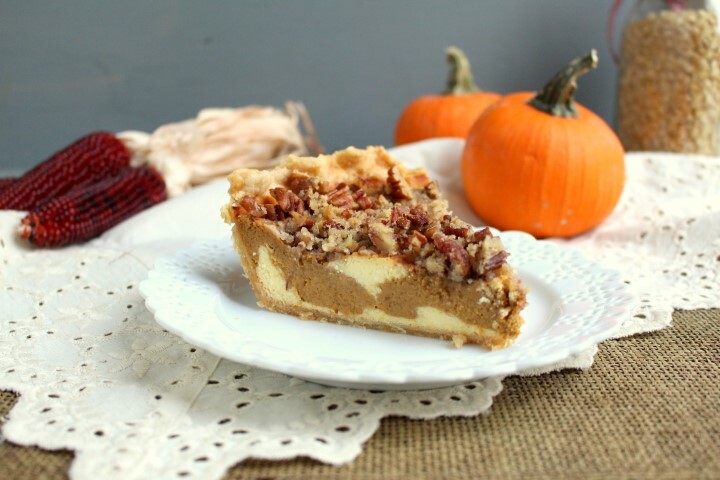 It’s a great way to make ahead a dessert for thanksgiving. Simply make the bars as directed in the recipe and let them cool completely on the counter. Then, cover them tightly. I use a layer of plastic wrap and then a layer of foil. And use a sharpie to write the name of the dessert and date on the foil. The sour cream layer can crack a bit if they are frozen too long or not covered well. So freeze this recipe with caution. 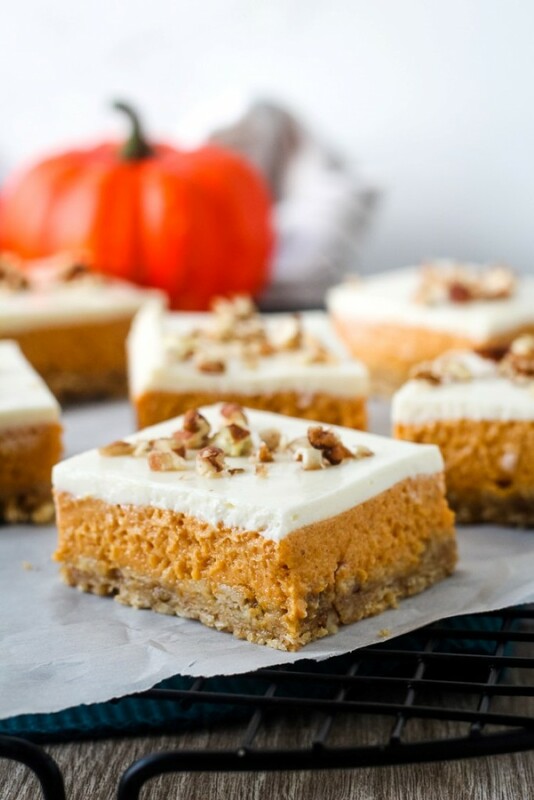 Pumpkin cheesecakes with topping freeze best. When ready to thaw, place the pan in the fridge to thaw overnight. You’ll have to plan ahead to serve them, because depending on the temperature of your fridge it will take at least 12 hours. Most of the recipes you find on my site are family recipes, or ones I have developed myself. However, occasionally I find a recipe that is too good not to share with you which is the case with these Easy Layered Pumpkin Cheesecake Bars. This recipe is from the Betty Crocker Big Book of Cookies Cookbook with a few minor adaptations. I got my copy second hand. While there are a lot of recipes that use mixes, there are a few that have become favorites. My cinnamon roll blondies were adapted from a recipe in that book as well. Preheat oven to 350 F. Grease a 9 x 13 inch baking dish or line with parchment paper. Whisk together the flour and brown sugar. Cut in butter using a pasty blender until mixture resembles coarse crumbs. Stir in oats and nuts. Press the mixture into the bottom of prepared 9 x 13 inch baking dish. Bake for 15 minutes in a preheated oven. Meanwhile, prepare pumpkin cheesecake layer. Beat the softened cream cheese and sugar with a mixer until smooth. Beat in the pumpkin and pumpkin pie spice. Beat in eggs one at a time, just until combined. Pour the mixture over the warm crust. Bake for 20-25 minutes or until set and the filling looks dry on top. While baking, make the sour cream topping. Stir together the sour cream, sugar and vanilla. When cheesecake layer is done, carefully spread the sour cream topping on top. Bake for 5 minutes or until just set. Cool completely before cutting into bars. Garnish with additional nuts if desired. Store in the refrigerator. Here are some other layered cheesecake bars that look delicious. Chocolate Chip Cookie Cheesecake Bars from Love from the Oven. 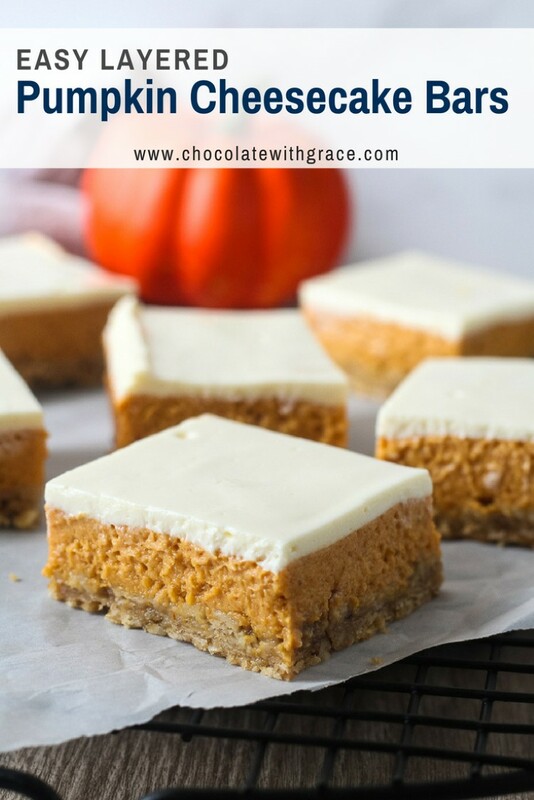 And these layered Peanut Butter Chocolate Cheesecake Bars from Handle the Heat look amazing! 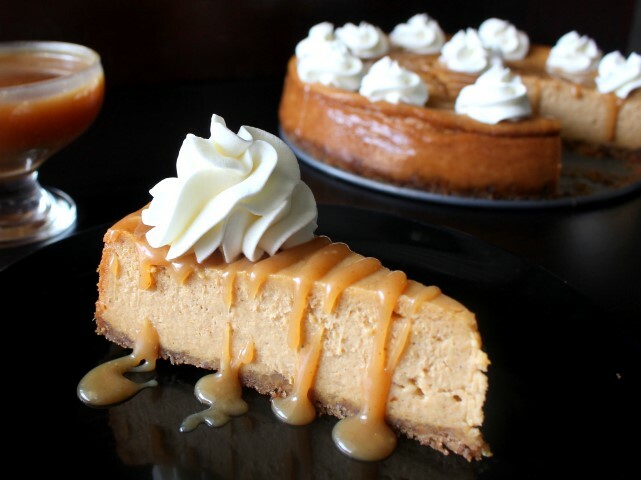 Here are some of my other favorite thanksgiving pumpkin cheesecake desserts. This looks so delicious! I’ve never made cheesecake before but I may just have to give this recipe a try! Yes please! If I make these do I have to share? This looks incredibly delicious! My family would love it!! 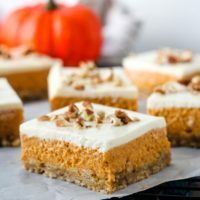 This pumpkin cheesecake is a delicious blend of two of my fall favorites! 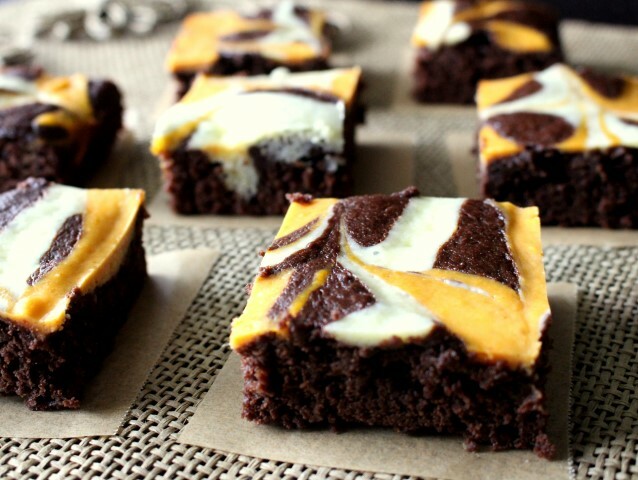 You make this look so easy, I can’t wait to make these!